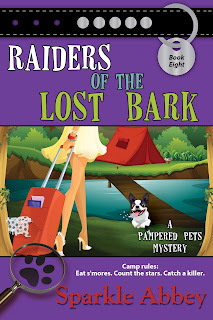 By Caro Lamont, Laguna Beach Pet Therapist from Sparkle Abbey’s Pampered Pets mysteries. I’m mostly for taking along my three – Dogbert, my mixed breed rescue dog, and Thelma and Louise, my two cats. They travel well and anymore it’s pretty easy to check out which accommodations are pet-friendly. Here are a few sites that I’ve found useful. Trips with Pets, Go Pet Friendly, and Pet Travel. If you haven’t traveled with your pet, it’s a good idea to do a short trial run to see how they tolerate being in the car for more than just a quick trip. Check with your veterinarian before you embark on a trip, just to make sure there aren’t any health issues. Take along something that’s familiar such as a blanket or toy. Something that smells like home will help to calm any anxiety. It you’re taking a road trip, don’t let your pet roam around the car. Also, plan frequent stops for both for bathroom breaks and to allow a little exercise. And make sure you have clear identification and contact info on their collar or tags. And I know you know this, but I have to give the reminder anyway, NEVER leave you dog or cat alone in the car. When it’s 85 degrees outside, the inside of a car can reach 102 degrees in 10 minutes and 120 degrees in just a half-hour. That’s even true with a window cracked a little. 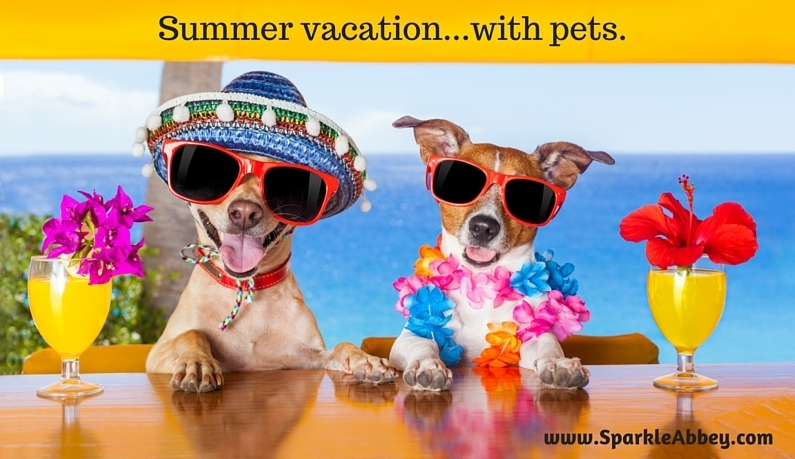 There are also other options, like boarding your pet or hiring a pet-sitter. With both of these options, make sure you check them out thoroughly. Check with your local Better Business Bureau or ask for references and make sure to follow-up with former clients. It's important that you're leaving your pets in the hands of someone you trust. So, what do you do when you travel. Do the pets stay home or come along? And what tips do you have either for traveling with pets, or for choosing a boarder/pet-sitter? 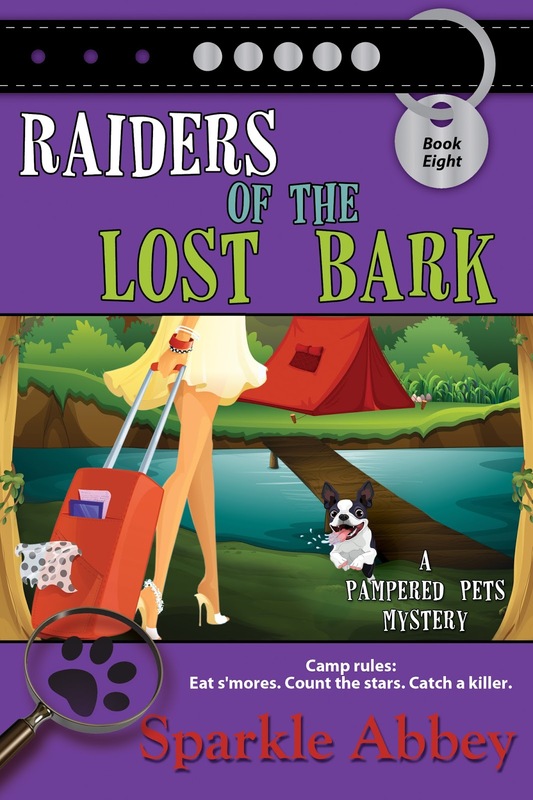 In Sparkle Abbey's latest, my cousin Melinda and her friend and employee, Betty Foxx, take their pets along on a "glamping" trip. You can check out how that worked out for them in RAIDERS OF THE LOST BARK. I had a dachshund, that has now passed, but she loved to travel. She was easy to travel with as well. Great advice! I've flown with a cat, and my husband has driven cross-country with a different one. How a pet responds depends very much on each individual animal. But we have an excellent petsitter at the moment, who not only comes by and feeds our three cats and cleans out their boxes, but also spends time playing with them (and leaves lots of cat toys!). Cats can be so self-sufficient that sometimes people forget that extra step of spending time playing with them. It's great that you have a petsitter that gets that! Thanks for the hints for traveling with pets. My dog does not like to ride in a car so he stays at the doggie hotel when we go on vacation.